There is an evolution in how brands are approaching their presence at the Outdoor Retailer trade shows. Brands are shifting their resources from elaborate, highly produced structures to a considerably more sustainably conscious approach. The booth presence on the floor and the message being sent is focused on being open, more conscious about the environment and embracing the outdoor culture. 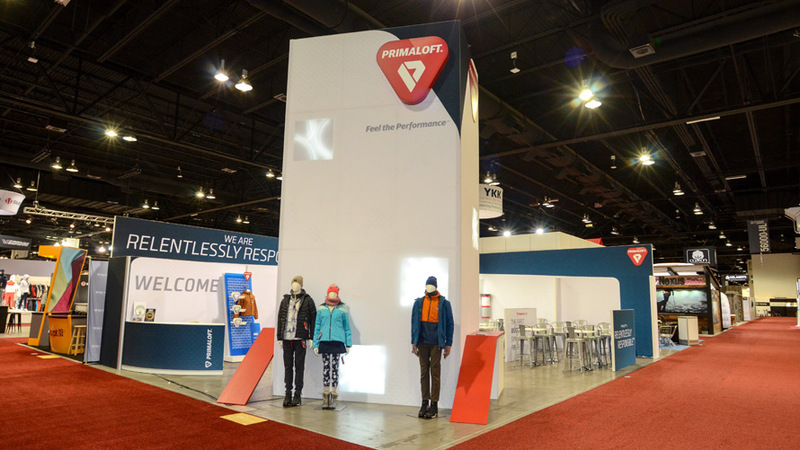 PrimaLoft’s goal for their new exhibit Outdoor Retailer Winter Show was to introduce a trade show display leveraging their “Relentlessly Responsible” platform. Relentlessly Responsible represents a continuous commitment from PrimaLoft to provide sustainable solutions throughout its business in order to lessen its impact on the earth. In conjunction with T35, their agency, the creative concept included a minimalistic yet compelling and premium experience emphasizing their message through an exhibit that would be sustainable and modular to allow them to leverage for many years to come. 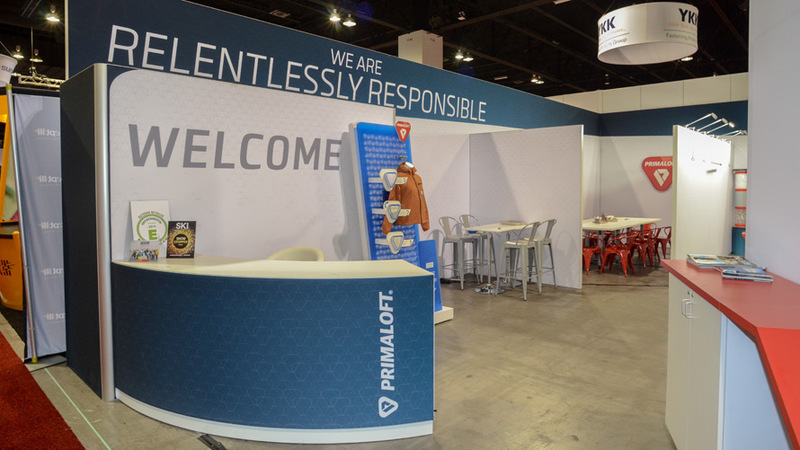 The target audience was brand partners, retailers and media outlets and the booth focused on meeting areas allowing for productive conversations. The display was mostly made up of our beMatrix rental frames and sustainable SEG Fabric skins. The large tower or “brand Hub” showcased brand messaging seen from a distance and from all angles, product, a looping messaging video on a an additional location for standing personal meetings. Within the tower walls were LED cut out panels which were mimicking a close up view of the fibers within the sustainable materials PrimaLoft uses. The remainder of the exhibit space was used for meetings in both private and semi-private. Modular walls were used to adjust meeting space as required throughout the event.